As is the ritual passed down since forever ago across all kinds of roleplay applications, we'll sort this from top to bottom step by step. Normally, we'd ask for a precise last name, but seeing over relatives and history, i would argue that this is one of those few cases where it's reasonable to be the way it is. Just a note for the learning experience - and in case anyone questions the point. I would however ask for a tad bit more on the Appearance, so far it is just describing the clothes and most immediate features. Even if she only uses one set of clothes constantly, there could still be just a little bit more description to the person as such. For example how her height or weight play into her general build and appearance. Something like that, to create a more dynamic image of the character as opposed to just describing a single picture more or less. Also, eye color changing is mentioned. While it's not forbidden, it can definitely be placed in more detail in special features. Maybe describe what moods it's likened to or even how it works (we're bending medical science anyway). Every character has special features, most player characters stand out like tattooed dogs even if they try to be as inconspicuous as possible. Another thing to note in the Appearance, you may carry a weapon for decorative purposes, but will have to purchase the actual item to be allowed to use it in any combat situation that matters (such as against players or in quests). Other then that, everything is smooth sailing until history. I'll note, that it's quite played up especially at the end (bonus points if you want to tone that down a little bit), so remember that you're just starting your game at this point and your actual capabilities are reliant on your stats, that you are allowed to interpret somewhat liberally around NPC and non-combat topics, but have to follow in more serious threads, quests, etc. On the content of the history itself, i would like to see at least small additions that help understand which phase happened around which age. Since in the beginning it skips quite a bit and then a lot of things happen apparently very quickly before it goes on to skip "a couple years" at once. And the girl is only thirteen. So maybe minor tweaks on that (and maybe the amount of murdering a thirteen year old can achieve against grown men of probably equal training) to iron out the very few kinks there are. On topic of the Nen, there's a bit more advice to be had. For one thing, remember that your Nen Theme does not need to describe your starting type Nen, but will be your "style" for every Nen you eventually might learn. So if you want to change the title of your Theme into a different term for the same thing, to be more adaptable to other types, now would be the chance. That's a choice you can make based on your own plans, ideas an creativity though. On the Nen itself, it sounds like a solid Specialist idea. The specifics, such as limits, costs and conditions of it you will have to work out once you work on getting it approved in the Custom Skills. That involves inventing the boni for the five Ranks of Nen Mastery as well, which should be on par with other types' boni. So we will judge that seperately but at this point we'll usually pre-judge on if the idea is solid and this seems reasonable enough to proceed. I realize this is a lot of text, but the changes you are now asked to implement are comparably easy and you're almost approved at this point. First of all, thank you for the swift reply! I'm edited the other things (I think), but I just wanted to say that the eye color changing isn't a magical or nen effect or anything. I didn't mean for it to sound like that... more like how in real life, some people's eye colors change depending on the lighting, and if she's glaring or something her eyes just look darker, more black rather than having the grey. Added in a few words here and there in the history that made it easier to understand what happened at what time; the exception might be how long she was at the Mafia, but I actually calculated that since later on I said three years later she found a way to escape and she was fourteen by then (I changed her age to fourteen). Thank you for the tip about the Nen theme thing! I'm still not sure whether the one I changed it to is still overly specific, but it's less so. The thing with the Nen Theme is, it should be something you can think up Nen Abilities for other Nen Types with. So what you have right now really isn't optimal. For example, a Fire theme would be able to conjure Fire Swords or the likes as Conjurer, be able to shoot Fireballs as Emitter, have fiery Aura as Transmuter, etc. While a Theme isn't limited to elements or things like that, it does dictate your "style" of techniques you are gonna use and "Summoning" does not really mix well with anything, since that is practically just Conjurer Nen.Whatever you had before might have been better (i can't immediately recall what it was) totally depending on if you can imagine applying it to other types. Themes should be kind of specific, but also stil have room to interpret them into different Abilities. Gon from the source material is a good example, using Rock, Paper, Scissors as the theme, he has the Rock attack which is Enhancer, the Scissors that are Transmutation and the Paper that's Emitter. It's all Rock, Paper, Scissors just applied and interpreted to the different Types. If you're finding further trouble settling on a good Theme, don't hesitate to ask either of us on Staff or any other User you might happen upon. We know Themes are a bit tricky, but since you already know what it should do, we only need to find a good name. Besides that, this application is fine. Remember to start working on a more in-depth description of your specialist Nen Ability including mastery boni and such in the meantime. Er. Bumping this ~ Changed the theme again, this time to Animals. I'm fine with the Theme, got to see how you make it into specialist when you introduce your Nen in the Skills Forum. Since 01 already did all other stuff and only told me to take a look at that I would say we are done here. [b]Appearance & Clothing:[/b] Nakiya has short black hair in a twintail style and somewhat innocent dark eyes. 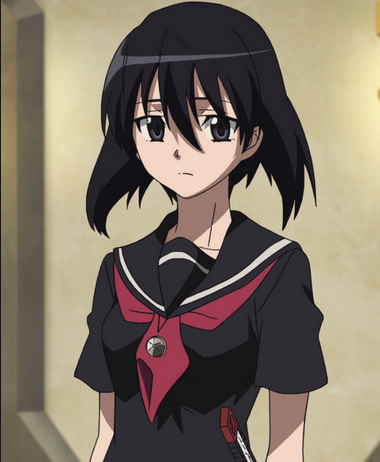 She wears a black sailor uniform with a red scarf and also a red belt that has a red side skirt cover. She also wears red gauntlets, and the entire outfit is completed by long black socks (reaching to her knees) as well as black mary-jane style shoes. Nakiya can nearly always be seen carrying around a small bag of cookies, which she will often be nibbling on or popping into her mouth with nonchalance. The girl will also typically be seen with either a katana or a wakizashi, each being one of her weapons of preference. These weapons are rather old, and they happen to be given to her by the Mafia during her trainee years; therefore, they are not actually useful and are simply good for practicing the arm movements and swings. [*]Nakiya has a distinctive mark on the back of her neck in the shape of a cross, pointed straight down her back. This was given to her by the Mafia, and it's not a tattoo; it's a scar. The mark itself is supposed to represent either a sword or a dagger and appears to be a bit lighter than the rest of her skin. [*]She can always be seen wearing the same clothes, no matter the occasion. [*]Mother, Father, & Blood Relations - Unknown. Nakiya has never met them, never heard of them, and has no desire ever to do either. She supposes that they are very poor and gave her up because a child would take up too much money, food, and space-- all three which could be used for themselves. She doesn’t hold a grudge against them but still has no desire to ever make contact during her lifespan. If their names/occupations are necessary, let’s just say that her mother is a beggar who goes by the name of Liya, while her father holds the same profession and is named John. Her siblings are unknown in number, age, and name. [*]Zee - A girl of about fifteen years, Zee was her main companion during Nakiya’s stay in Ryuuseigai. Both girls shared a close relationship, although each knew and acknowledged the fact that they would abandon the other if it was necessary; their bond was formed out of pure practicality, as each would have a harder time surviving on her own. Together, Nakiya and Zee can steal and forage more efficiently-- if it’s absolutely necessary, they can also share food or divide it equally. However, there is an unspoken message between the two girls; as soon as one begins to rely solely on the other, they will part. This is a relationship meant to assist in their survival, and both could do moderately fine without it, they simply do better with each other. [*]Usui - A boy of about seventeen years, Usui was in charge of much of Nakiya’s training once she was brought to the city by Mafia scouts. He was harsh; perhaps unnecessarily so, but Nakiya feels a slight sense of gratitude for all that he has taught her. Usui’s place in her heart is not really one associated with love, but rather with a feeling of debt. Although, Nakiya absolutely hates the Mafia and therefore Usui-- she simply can’t erase the feeling of owing him for something after the boy taught her how to better survive and get accomplish her goals. [b]Personality:[/b] Nakiya is a strong-willed girl and definitely not a coward; however, often times she would rather go around a problem than solve it head-on. She cares a great deal about her safety and her survival, rather than honor or doing what is right; backing down is not a problem if she’s going to survive and there won’t actually be any sort of serious or important repercussions. Nakiya is unpredictable and often times flighty, but she understands that some degree of trust is required in order to get anything done while working with other people; the girl is willing to give that amount to others, but not any more than is required. She has a certain innocent feel to her despite the fact that she is anything but that, especially with her occasionally silly or unreasonable antics. An example would be her hugely possessive nature when it comes to food, especially sweets and her own special cookies that she carries around all the time. [*]Selfish & Self-Centered - As a child, Nakiya had to fend for herself and was constantly on the verge of either starvation or death from exposure to the elements, theft from other children, etc. She is extremely possessive of food and clothing and does not share willingly with other people. If she does happen to share either with you... it’s a true sign that you’re a friend, a very rare occurrence. [*]Apathetic - Nakiya refuses to form bonds with other people and prefers to turn them away. She’ll never let anyone know the contents of her heart and won’t open up to anyone-- additionally, it’s very difficult for her to act upon her feelings. An example of this is if she sees a starving orphan, Nakiya will walk right on by and think nothing of it; this is a by product of being forced to focus on her own survival. [*]Flighty - Unpredictable and often untrustworthy, Nakiya doesn’t necessarily have a good reputation among coworkers. She’s more worried about her own skin than what’s best for everyone else. Nakiya will backstab and betray people without a backwards glance or a single thought; it’s simply second nature to her after going through a certain environment growing up. [*]Clever & Cunning - Nakiya is quick witted and reacts well under pressure and when put into dangerous situations. She can think on her feet and won’t hesitate to use sources that some other people might consider to be undesirable-- for example, manipulating good-hearted people or using their pity for her to an advantage. [*]Swift & Stealthy - Perhaps surprisingly, stealing requires one to be quite quick on their feet; although the main point is to not get caught (and that’s why stealth is second nature to her) Nakiya has also learned that many situations can be solved by simply running away and not getting caught. [*]To become strong - Nakiya hates the idea of being weak or unnecessary, especially after growing up in Ryuuseigai and with the Mafia, where dead weight is immediately removed (either by execution or elsewise). She has a strong desire to become powerful and able to accomplish whatever she likes. [*]To bring down the Mafia - Nakiya loathes the group of criminals, despite the important role they’ve played in shaping her to where she is right now. The girl aims to bring their carefully structured and secretive plans all crashing down to the ground, as well as destroying the group entirely. [*]Nakiya's Nen techniques are associated with animals. For example, an emission technique might be similar to astral claws, enhancement techniques might give her certain properties or strengths that animals have, etc.